You always hear of the damage that parasites like ticks and heartworms can wreck on your pet, right? You don’t worry too much, though, because your pet is protected. Well, they’re still protected if it’s been a few years since you’ve brought them into a Lexington veterinarian, right? Not always. If you’re worried about parasite prevention, it’s best to set up an appointment for a checkup with a vet in Lexington. Which Parasites Can Affect Pets? •	Heartworms: As a human, you know to stay away from mosquitos. Make sure to extend the same courtesy to your pet. Cats and dogs could get heartworms, which develop in the lungs, blood vessels, and heart, hence the name. •	Ticks: These external parasites typically stay in long, tall grasses. Ticks will feast on humans and pets alike, burrowing deep within the skin and drinking blood for as long as they feel like it. They may also have babies, furthering the infestation. •	Hookworms: Like ticks, hookworms drink blood and sink themselves in with their long, pointy teeth. These parasites lead to symptoms like diarrhea, weight loss, skin issues, exhaustion, and feelings of weakness. •	Roundworms: Growing in the pet’s intestines and stomach, roundworms are present in puppies and kittens from birth. By deworming pets, the veterinarian in Lexington will free the animal of roundworms. •	Tapeworms: If your cat or dog consumes dirty water, they could develop tapeworms. Also growing in the intestines, it’s especially important to get treatment for tapeworms right away. It is possible to spread these to humans. 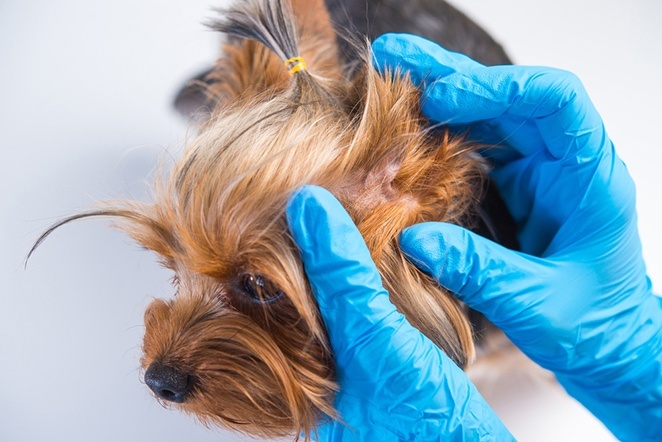 Once your Lexington vet has cleared any traces of internal and external parasites from your cat or dog, how can you keep these unwanted creatures from coming back? Your vet can suggest some external parasite prevention and internal parasite prevention tips. First, get your pet on a medication to keep them safe from parasites. These medications may need to be refilled every few months or so. You should also ask your Lexington vet for heartworm testing and another parasite testing. Be smart at home, too. Keep your pets away from standing, stagnant water, mosquitos, and tall grass. Be aware of the symptoms of parasite infection so you can bring your pet into the vet right away. If you’re looking to safeguard your pet from intestinal parasites like tapeworms and roundworms, come see us at Hartland Park Animal Hospital. As your veterinarian in Lexington KY, we specialize in external parasite prevention and internal parasite prevention. Our other services are pet vaccinations, wellness exams, spaying/neutering surgeries, microchipping, and pet dental care. Our phone number is (859) 245-7387 and our address is Hartland Park Animal Hospital on 4750 Hartland Parkway, Suite 170.